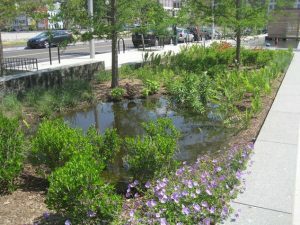 Green solutions are storage devices such as rain barrels and cisterns, as well as constructed green spaces like rain gardens, green roofs, enhanced tree pits, or swales, all designed to capture and store stormwater or release it in ways that don’t cause flooding. These containers capture stormwater from roofs and save it for another use. 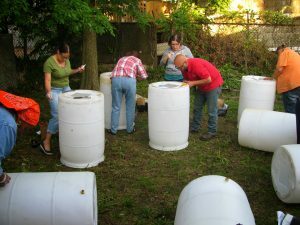 Cisterns are larger versions of rain barrels that collect from multiple roofs. Community benefits: conserves water, reduces water fees, reduces combined sewer overflows. During dry weather, these look like simple gardens. 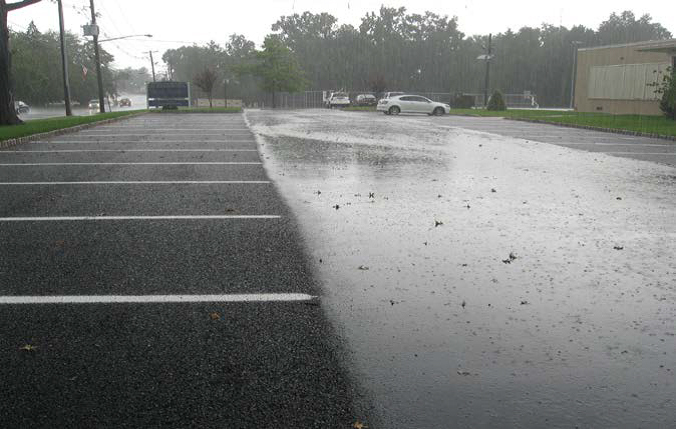 When it rains, stormwater flows in and seeps into the ground. 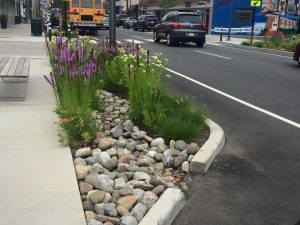 Community benefits: neighborhood beautification, adds green space, improves air quality, reduces heat island effect, reduces flooding, reduces combined sewer overflows. This type of paving material allows water to seep in rather than rush off into sewers. It can be used for many paved areas. Community benefits: filters and cleans stormwater, reduces combined sewer overflows. Blue roofs are designed to retain and slowly release water after a storm. 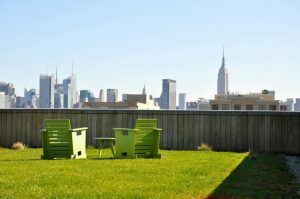 Green roofs are planted with grass and other plants. Community benefits: cleans and stores stormwater, reduces combined sewer overflows. When cities make major repairs to streets, they can include designs for areas with grass and trees to absorb stormwater. Community benefits: neighborhood beautification, adds green space, improves air quality, reduces impacts of combined sewer overflows. 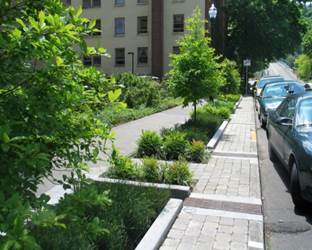 Runoff from the street is diverted by a curb cut and routed into an enhanced tree pit, where specially engineered soils and native plant species absorb water and filter associated pollutants. In some enhanced tree pits, storage chambers hold additional runoff, available for plant uptake or groundwater recharge. 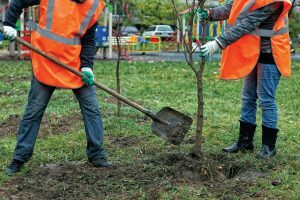 Community benefits: neighborhood beautification, increases property values, adds green space, improves air quality, reduces heat island effect, cleans stormwater, reduces combined sewer overflows. Community benefits: neighborhood beautification, increases property values, adds green space, improves air quality, reduces heat island effect, cleans stormwater, reduces combined sewer overflows.